The first two years of Group A didn’t go well for D!ck Johnson, but he turned things around and experienced the best years of his career. Holden would rather forget Group A entirely. Except for Bathurst. 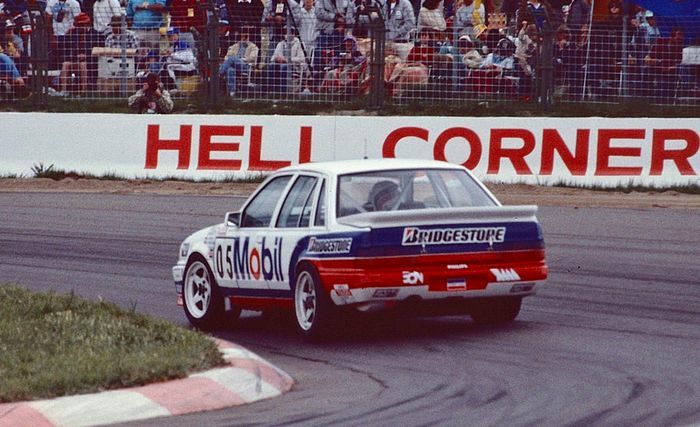 Peter Brock only managed one Group A win, Bathurst 1987. When Holden moved their factory backing to Tom Walkinshaw Racing, nothing changed. Group C had been good to Holden. Despite challenges from Nissan and Mazda, the Group C rules created a two horse race between Ford and Holden. Between them, Falcons and Holdens carried drivers to all but one ATCC title from 1973 to 1984. Group A delivered a seismic shift in Holden’s competitiveness.. Even though Brock cleverly shaved a few cc from the the VK SS’s Holden V8 to bring it down a class, they were still too heavy and underpowered. The VL brought major aerodynamic improvements but it was still not enough. The European manufacturers had enjoyed a three year head start over Holden. But they were reliable, and Brock managed to win Bathurst in 1987. Holden was able to live with this performance. Winning Bathurst sold more cars than winning a championship, and Brock was one of Australia’s best drivers and a popular figurehead for Holden. But things had started to go wrong. It culminated in the Energy Polariser and the very public split between Brock and Holden. Holden needed a replacement, and they found one in Tom Walkinshaw Racing. TWR had been running Rovers in European Group A racing, but they were losing their competitiveness. Before becoming the factory Holden team, they were already planning to run Commodores in Europe from 1988. The Ford Sierra RS500 had not arrived in 1986, so the Commodore was seen as a potentially competitive package that simply hadn’t had the development time of its European rivals. As a result TWR already owned a complete HDT VL Group A and three body shells in the UK. Like Holden, Larry Perkins had split with Brock over the Polariser. Up until 1985,he was responsible for the HDT racing operation, and had full control of the race car specification. Perkins was vehemently opposed to the use of the Polariser. After discovering that one was fitted to his car at Lakeside, he quit HDT and Joined D!ck Johnson as engineer/co-driver for the 1985 Endurance Championship. Perkins started his own team in 1986, with a VK Holden Commodore. 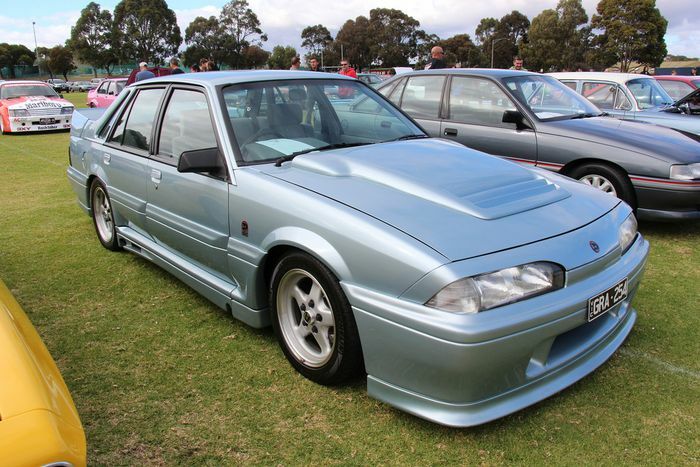 In 1988, a single HSV Commodore was entered for Larry Perkins under the Holden Special Vehicles banner. The HSV VL SS was revealed in February, but industrial disputes and manufacturing complications pushed production back to September, so the old 1987 HDT SS Group A was used. The car, PE004 was a new build by Perkins Engineering in ;ate 1987. 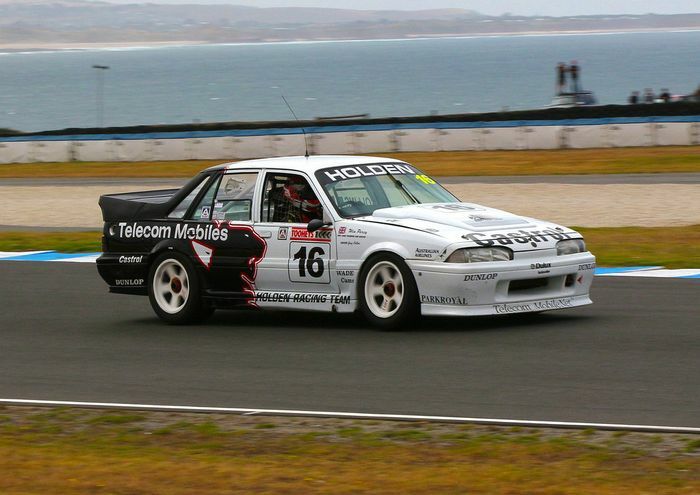 It had debuted at the Calder Park round of the 1987 WTCC with Perkins and Denny Hulme driving to sixth place. WIth no HSV Group A to race yet, PE004 was pressed into service in the 1988 ATCC. There hadn’t been any major improvements to the car, so the Group A rules continued to hold back the naturally aspirated V8 Holdens. The Holden teams were left behind by Ford and BMW, with DJR’s D!ck Johnson and John Bowe winning almost everything. Perkins’ best result was a third at Sandown and he finished third overall. Particularly embarrassing was Peter Brock finishing sixth in his M3, despite the BMWs being relegated to class two. 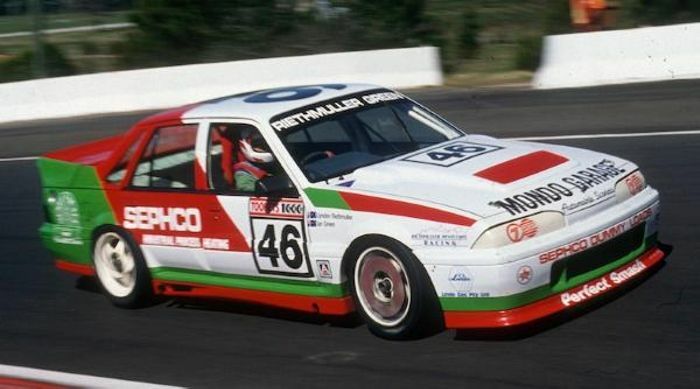 The HSV Commodore SS Group A SV Walkinshaw made it’s racing debut at the 1988 Sandown 500. 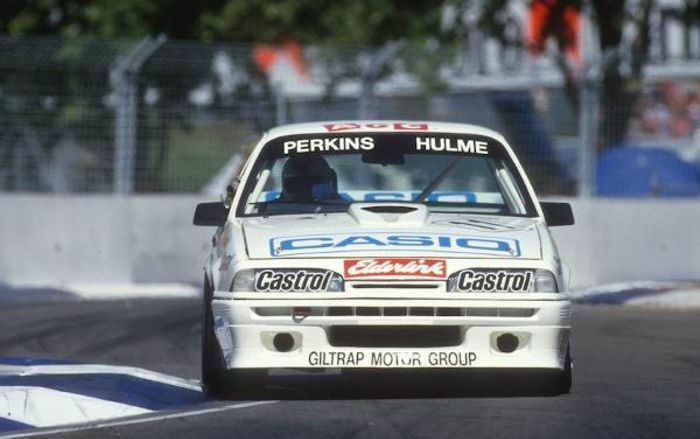 Perkins had a new car.Jeff Allam and Armin Hajne (filling in for Walkinshaw), drove PE004, which had been upgraded from HDT to HSV specifation. Bathurst saw Harrington replaced by Tomas Mezera, who partnered with Perkins in the #11. Percy moved into the seat vacated by Harrington alongside Crompton in the #16. Three cars were brought, all built by Perkins, but the third car was purely a practice car and not entered in the race. Once again they were thoroughly outpaced by the Fords and Nissans. The 6th and 7th placing for the #11 and #16 was not a bad result, but they were 3 laps behind race winners Johnson and Bowe. 1990 would be HRT’s third and final year with the VL. TWR was running HRT themselves for the first time, with a single ex-Perkins car driven by Percy and Crompton. Following his appearance at Bathurst the previous year, Walkinshaw invited Percy to relocate permanently to Australia to manage, and drive for, the Holden Racing Team. Perkins was left to continue with his own team. He retained cars, but had no sponsorship. Brock had Mobil sponsorship, but wanted to move away from the Ford Sierra. The two entered into a “marriage of convenience” and ran as a two car team. HRT elected to run a single car driven by Percy, with Crompton driving a second car at Wanneroo (Barbagallo). Percy’s results were ordinary, a reflection of the car rather than the driver. He earned just one podium, at Lakeside, and finished 8th in the championship. In order to run the second car, HRT resurrected the TWR car from 1988, which became the #16 for both Sandown and Bathurst. HRT’s Sandown effort consisted of Percy and Crompton’s #16 only. A strong qualifying result of fourth was followed by brake failure on at turn one resulting in a DNF. The final race for the VL before it was superseded by the VP was the 1990 Australian Grand Prix support race, where it had won at the hands of Larry Perkins in 1988. Saturday’s race ended in disaster, with Percy’s suffering an engine failure. He redeemed himself on Sunday, charging from 23rd to 3rd in just 10 laps. Whilst not a particularly successful car, The Plastic Pig, the Batmobile, is a historically significant car in Australian motorsport. It represents the first HSV road car, the first car to win a race under the Holden Racing Team banner, and is also the first race winner to come from Perkins Engineering. Against the Ford Sierra RS500 Cosworth, E30 BMW M3 and Nissan Skyline GTS HR31, the HSV shouldn’t have won a single race, but sometimes it did. Sometimes plastic pigs can fly.